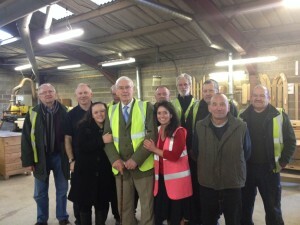 Above: l-r, Peter Hinge, David Hunt, Tracy Power, Nick Hamblin, ‘AJ’ Charlton (chairman and CEO), Bob Carpenter, Debbie Chivers, Terry O’Mahoney, Vaughn Swift, John Surrey and Tony Hillier. THE Charltons Group, based at Buckland Down near Frome have made presentations to 10 members of staff who at the beginning of this year completed either 25 or 40 years of service with the gates, fencing and furniture company. ‘AJ’ Charlton, chairman and CEO made the presentations. Peter Charlton, managing director said, “This is a very proud moment for the company. After over 100 years, we still remain a family-run business, but our success has been built on both the loyalty and the great experience that our employees are able to bring to the job. One of those long service employees working for the company is Tony Hillier. He distinctly remembers his interview for the job just over 40 years ago. Tony recalls, “The interview was with the late Michael Charlton and his father AJ Charlton with Michael doing all the talking. AJ then suddenly interrupts the interview to enquire as to whether I could ride and handle a horse.